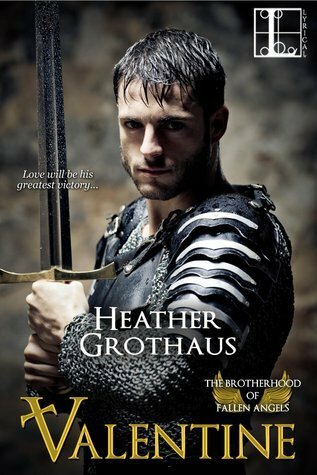 VALENTINE (THE BROTHERHOOD OF FALLEN ANGELS) BY HEATHER GROTHAUS is an interesting Scottish Medieval Historical Romance. #1 in a new and exciting series, “The Brotherhood of Fallen Angels”. Meet, Valentine Alesander, he and three other Brothers of the order have been accused of plotting the siege at the Christian fortification of Chastellet. They must prove their innocence, stay alive long enough to prove said innocence, but will they convictions, stop them from finding their Lady loves? Lady Mary Beckham. a free-spirited English Lady, who is was once he was promised to Valentine, now she wants out of their marriage contract, she wishes to marry another. Filled with revenge, danger, treason, dangerous plots, romance, passion and finding love. It does have a lot of humor, with humorous banter, but it also has a dangerous side, as well. But can Valentine hold onto his love or lose both their lives and the love of his life? A steady paced tale of love, treason, and romance, albeit, a bit slow in the beginning. Please hold on and continue to read, you will not be sorry you did. “Valentine” is a unique tale, with uniquely wicked characters. A bit different Historical Fiction/Romance, but one that promises to be very entertaining. An enjoyable and vastly entertaining tale!